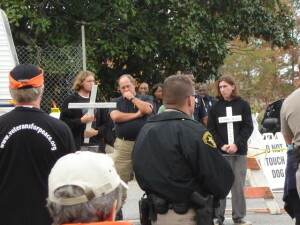 (APN) FORT BENNING — Three college students from Kennesaw State University were arrested at the protest of the School of the Americas, held in Fort Benning, Georgia, Sunday, November 19, 2007, for carrying white crosses that were said to be too large. 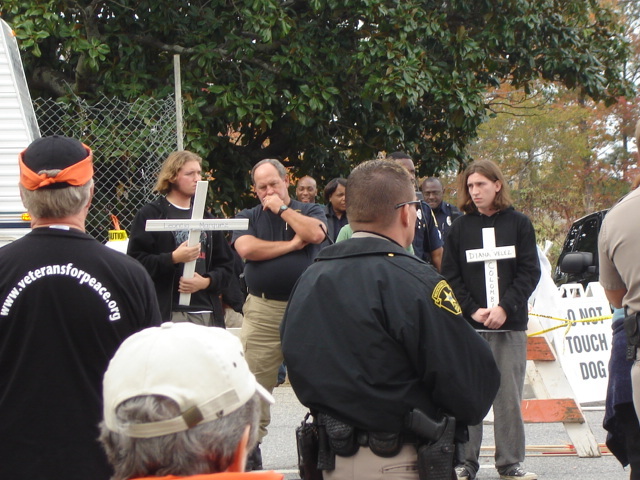 The so-called White Cross Three include Matthew Boynton, 20, a sophomore in International Affairs; Ashley DeBelardino, 18, a freshman; and Eric Pierce, 26, a junior in History Education. Each are members of the KSU Green Party Chapter and are also affiliated with the Georgia Peace and Justice Coalition. 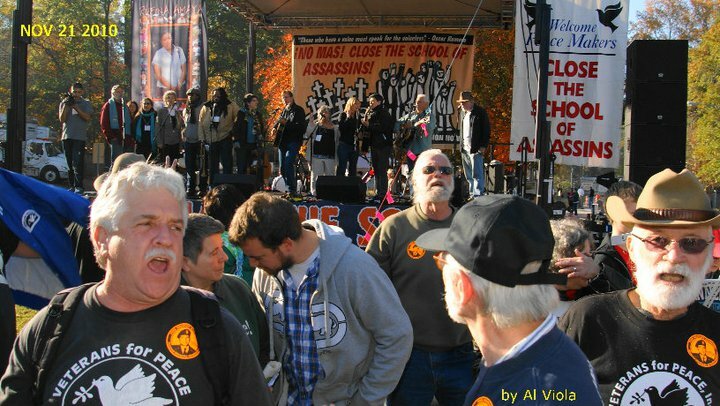 The three were attending the annual SOA protest, which this year drew some 20,000 activists from around the country and the world, to close the notorious Western Hemisphere Institute for Security Cooperation (WHINSEC). 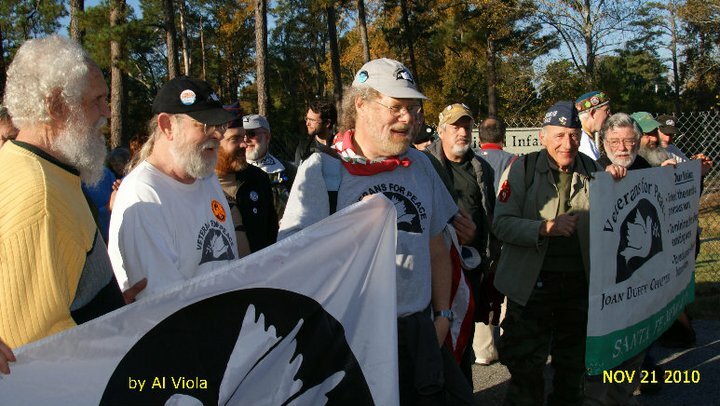 WHINSEC is formally known as the School of the Americas, which activists say trains US and foreign militaries to torture, disappear, and kill people throughout Latin America. 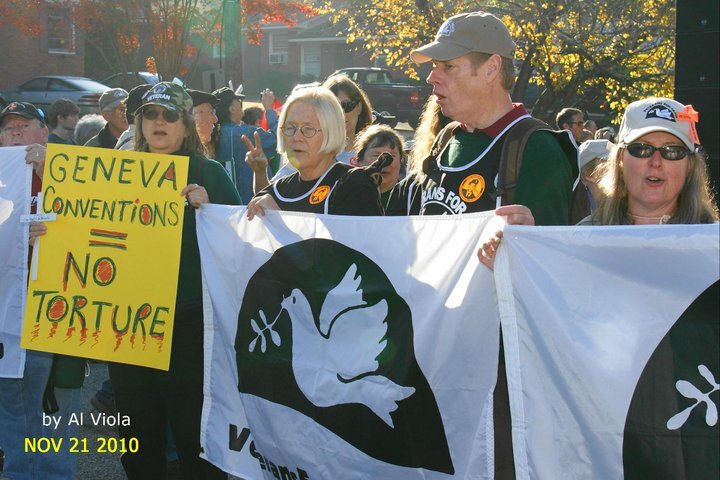 Also in attendance at this year’s protest were Presidential Candidates Dennis Kucinich (D-OH), seeking the Democratic nomination, and former US Rep. Cynthia McKinney (D-GA), who is seeking the Green nomination. “Really what we were going into the action for, was to get the stick law examined. 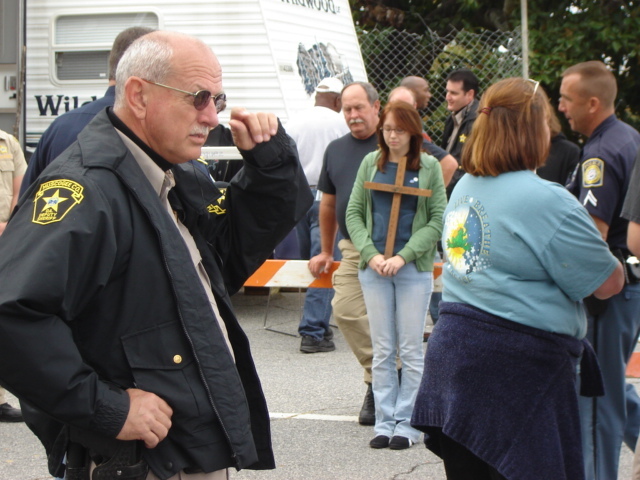 In recent years, cops have been turning away crosses that were slightly too large. We thought it would be helpful to try to get arrested for that and try to challenge that,” Matthew Boynton told Atlanta Progressive News. “If you want to disrupt their [SOA Watch’s] agreement that’s your decision, but that’s what you’re doing… All we’re asking you is to cooperate, all right? And right now I’m asking, take your over there [sic], we’re going to have to clear the way so other people can come in. I’m trying to be as nice as I can, all right?” the officer said. “I’m trying to be as nice as I can too, Sir, and I would like to place this cross in the fence as a show of solidarity,” Boynton replied. However, Boynton said SOAW told him that they had not agreed to the guidelines. “I have had it clarified from several people from SOA Watch, and no, they never agreed to those stipulations. The stick law is a City ordinance, but SOA Watch had no role in the restrictions. They had not agreed to those things. And I guess in previous years, the City had the protesters walk through metal detectors and that was challenged,” Boynton said. “The SOA people didn’t feel that way at all. We had dinner with most of the SOA organizers later on. They were very pleased we can take that stick law to court,” Boynton said. The three were taken to jail where they were processed and sat in a holding cell for several hours, until SOAW posted bond for them at $365/each, including a prepaid fee for if they didn’t show up in Court. “The three worked with SOAWatch to post their bond and were released from custody on Sunday afternoon. On Monday, they appeared at the Recorders’ Court in Columbus, GA, to be informed that their cases had been forwarded for review to the State Solicitor’s Office. I contacted that office, and they indicated that the review would take place this week, however, due to the Thanksgiving holidays, they may not have information for me regarding charges until next Monday,” Ruth O’Neill, SOAW legal team member, wrote in an email obtained by Atlanta Progressive News. “It was not very spontaneous. We had thought about it for a while. We had talked with some people from SOA Watch the night before and earlier that day,” Boynton said. “Those were not our crosses. We saw them on the ground. They were in a pile of cross rejects. So we picked them up and tried to get them through once and we were rejected. And we got more support for bringing them in. So I went mainly to Students for Democratic Society. I talked with them and convinced them to at least help us record the process. They helped out, they showed support. There was a significant crowd behind us as we were pushing forward,” Boynton said. “We were turned away by the cops and we were eventually arrested for obstructing an officer,” Boynton said. The students plan to challenge the legality of the stick law on the grounds of free speech. The students were charged with obstructing an officer, a misdemeanor, but not for carrying a cross too large; however, that charge “only holds in Court if what the officer tells us is lawful,” Boynton said. “It’s a restriction on free speech. It’s obvious that protesters bringing in signs too thick or too long or bringing in small flag poles, that’s not dangerous. Those are not being used as weapons, only to convey speech. When the City says this, what they’re really saying is you can only convey your freedom of speech how far we want it,” Boynton said. “I think it’s just a tool police forces use to harass protesters. Anytime a police can step into your business and take away your sign and tell you you can’t use whatever you want to your protest is giving the cop power over you, and I consider that harassment. And it also gives them grounds to do other things to you,” Boynton said. Boynton also disagrees with the notion that the white crosses could be used as weapons. “I think it’s ludicrous. I don’t think they could be used as weapons. And even if there was the possibility to use them as weapons, it’s a peaceful area, these are protesters who are nonviolent and there’s no threat of using them as a weapon if they could be used as such,” Boynton said. “Essentially anything could be used as a weapon. You can strangle someone with a flag, but a flag is not a weapon,” Boynton said. “We have fulfilled somewhat of a moral obligation. It’s a moral obligation to oppose unjust laws. Martin Luther King agrees. Rosa Parks agrees,” Boynton said. “It’s the first time Ashley and I have been arrested. Eric was arrested at the RNC [Republican National Committee Convention] in New York,” Boynton said. “We’re not facing any prison time to my knowledge. If we lose the case, we will lose our bail money, and maybe a fee, maybe a fine. I don’t believe there’s any repercussions outside of that for losing the case,” Boynton said. 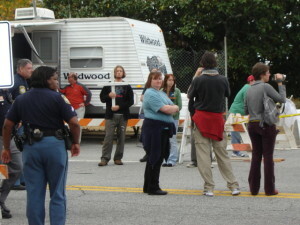 Eleven other protesters were arrested at the rally for crossing a line onto the SOA, according to the Columbus Ledger-Enquirer newspaper: Teri Lynn Rainelli, 25, Canton, OH; Augustine Joseph Roddy, 43, Chicago, IL; Diane Lopez Hughes, 58, Springfield, IL; Arthur Richard Landis, 74, Perkasie, PA; Ozone Bhaguan, 33, Duluth, MN; Leanne Christine Clausen, 29, Chicago, IL; Edwin Ross Lewinton, 76, Newark, NJ; Chris Alan Lieberman, 54, Albuquerque, NM; Joan Cecile Anderson, 65, Casper, WY; and Stephen Peter Schweitzer, 45, Binghamton, NY. A vote in the US House to close the SOA failed by a close margin on June 21, 2007, by 203-214. US Rep. John Lewis (D-GA) was the only Member of Georgia’s Congressional delegation to vote yes. US Reps. Johnson and Scott did not vote. US Rep. Barrow, Bishop, Marshall, and each of the Republican Members from Georgia voted no.